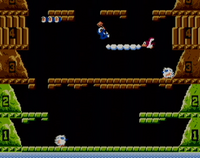 Ice Climber (アイスクライマー, Ice Climber) is the sole game of the Ice Climber series. It was developed by Nintendo and released for the Nintendo Entertainment System in 1985. The game is one of the twelve playable Masterpieces in Super Smash Bros. Brawl. It can be played for 40 seconds and starts at the first level. Screenshot from the Masterpiece in Brawl. Popo and Nana, otherwise known as the Ice Climbers themselves, are the stars of this game and are playable in Super Smash Bros. Melee, Super Smash Bros. Brawl and Super Smash Bros. Ultimate. The stages Icicle Mountain and Summit are based on this game. Topis and Polar Bears appear in Melee as common enemies on the Icicle Mountain stage of Adventure Mode. Polar Bears also appear as enemies in the Super Smash Bros. for Nintendo 3DS mode Smash Run. 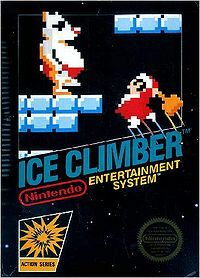 Both the "Icicle Mountain" and "Ice Climber" songs are a medley of the main level theme and bonus level theme from this game. The Target Test stage for the Ice Climbers is also a similar rendering of the game set-up, including a flying Condor at the top of the mountain. This page was last edited on December 22, 2018, at 12:38.